Brain death and the definition of death. Coma, vegetative states, and other disorder of consciousness. Ethical and philosophical issues in neurology. James L. Bernat, M.D., formerly the Louis and Ruth Frank Professor of Neuroscience at Dartmouth Medical School, earned a B.A. from the University of Massachusetts (1965-69) and an M.D. from Cornell University Medical College (1969-73). He trained in internal medicine and neurology at the Dartmouth-Hitchcock Medical Center (1973-77). 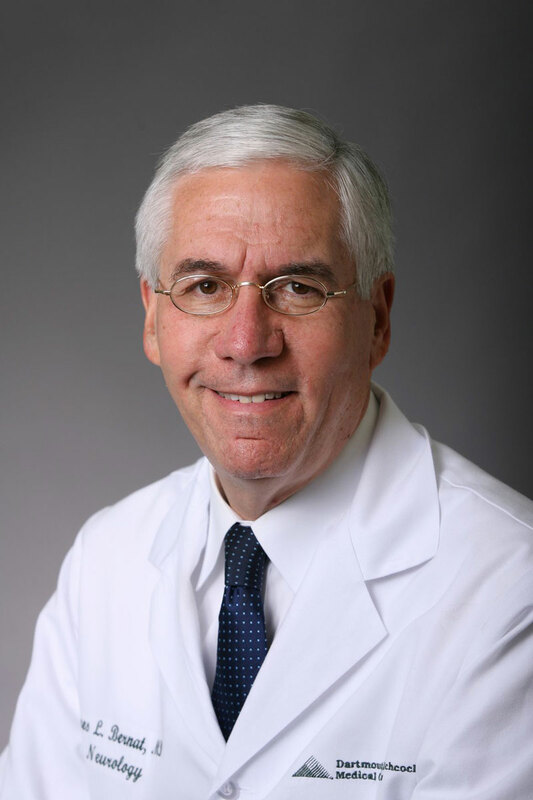 Dr. Bernat has been a Dartmouth Medical School faculty member since 1976 and has held the rank of Professor of Medicine and Neurology since 1989. Dr. Bernat was the Director of the Program in Clinical Ethics at the Dartmouth-Hitchcock Medical Center. Previously he served as Assistant Dean of Clinical Education at Dartmouth Medical School. He served for 28 years on the American Academy of Neurology Ethics, Law & and Humanities Committee, with 10 years as chairman. Dr. Bernat has been elected to Phi Beta Kappa, Alpha Omega Alpha, and fellowships in the American College of Physicians, the American Academy of Neurology, and The Hastings Center. He is a member of the Dana Alliance for Brain Initiatives. In 2011, he received the Presidential Award from the American Academy of Neurology for lifetime service to American neurology. Dr. Bernat's scholarly interests are in ethical and philosophical issues in neurology. He has authored over 250 articles and chapters on topics in neurology and clinical ethics. He is the author of Ethical Issues in Neurology, 3rd ed. (Lippincott Williams & Wilkins, 2008), coeditor of Palliative Care in Neurology (Oxford University Press, 2004), and coeditor of Ethical and Legal Issues in Neurology (Elsevier, 2013) He testified on the vegetative state before the United States Senate Health Committee and was a consultant on brain death to the Institute of Medicine, the Vatican Pontifical Academy of Sciences, and the Pontifical Academy for Life. He chaired the US DHHS HRSA Division of Transplantation panel on determining death in organ donors and served on the World Health Organization international committee on standards for death determination. Palliative care and inpatient neurology: Where to next? Neurology. 2019 Mar 27; pii: 10.1212/WNL.0000000000007354. doi: 10.1212/WNL.0000000000007354. Epub 2019 Mar 27. Strategies to improve uniformity in brain death determination. Neurology. 2019 Feb 26;92(9):401-402. doi: 10.1212/WNL.0000000000006994. Epub 2019 Jan 25. A Conceptual Justification for Brain Death. Hastings Cent Rep. 2018 Nov;48 Suppl 4:S19-S21. doi: 10.1002/hast.946. Conceptual Issues in DCDD Donor Death Determination. Hastings Cent Rep. 2018 Nov;48 Suppl 4:S26-S28. doi: 10.1002/hast.948. Author Response: Practice Current: When do you order ancillary tests to determine brain death? Neurol Clin Pract. 2018 Oct;8(5):364. doi: 10.1212/CPJ.0000000000000539. Semin Neurol. 2018 Oct;38(5):495-496. doi: 10.1055/s-0038-1673410. Epub 2018 Oct 15. Author response: An interdisciplinary response to contemporary concerns about brain death determination. Neurology. 2018 Sep 11;91(11):536-538. doi: 10.1212/WNL.0000000000006154. Patients are harmed by physician burnout. Neurol Clin Pract. 2018 Aug;8(4):279-280. doi: 10.1212/CPJ.0000000000000483. AMA J Ethics. 2018 Aug 1;20(8):E708-716. doi: 10.1001/amajethics.2018.708. Epub 2018 Aug 1. Practice Current: When do you order ancillary tests to determine brain death? Neurol Clin Pract. 2018 Jun;8(3):266-274. doi: 10.1212/CPJ.0000000000000473.